you were to ask me details about what I have been doing the last two weeks since I last blogged I would be hard pressed to tell you. Except to say I have been busy, very busy. Knitting for knitonthenet, sewing for me, catching up on all sorts of things in the house and accounts (yuck), pattern writing, tech editing, answering emails etc., and the two weeks have just disappeared. For the last two days I have been writing almost constantly, preparing for a talk I'm giving. I have, however, been continuing to go through my patterns, making bigger and bigger piles for each decade right up to 1959, which is where I came across these little beauties. The answer to that perennial question at this time of year "Do I really need boots on, but its too cold for shoes?" The answer is "No you don't need boots, you need Spats!" 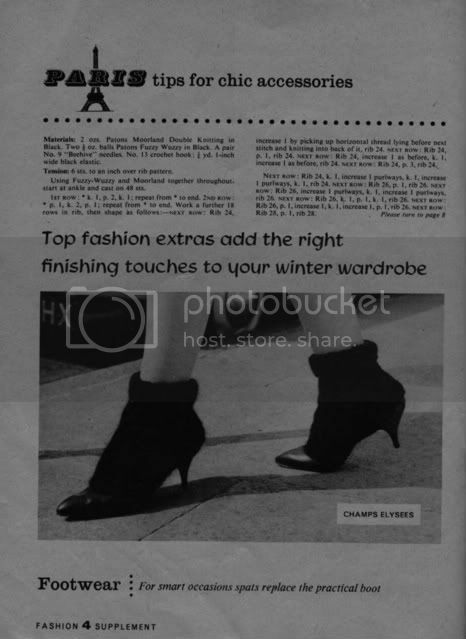 This pattern is in a Stitchcraft from 1959 and is in a fashion supplement direct from Paris. The spats go over the shoe and are held with elastic under the sole. I will share the full pattern if you really want me to when I return in a few days after my talk, a visit to the Knitting Resource Library at Winchester School of Art and a trip to see my lovely uncle Tom who is unfortunately very poorly. Edit: I have just found out I will be making a pair of these for my daughter when I get back, so if anyone would like to join me in a SPATKAL do let me know. I've been so seriously behind in photographing and cataloguing finished objects, but today I managed to take a few photos this morning whilst there was still some natural light available. Since lunchtime there has been a heavy snow laden sky and it has been snowing steadily for a number of hours now. Before I reveal my FO's a little update on my last post. Unfortunately, no the pigs aren't mine. I intend to have one or two at some point soon but I'm starting with chickens in April and working my way up. Also all the yarn that went from the middle of the room went in a number of directions. Some on top of the bookcases, some into the outhouse/utility/laundry room which fortunately is heated and some at present into the loft whilst it gets sorted. And now, finally, for some FO's. The first two are from A Stitch in Time. 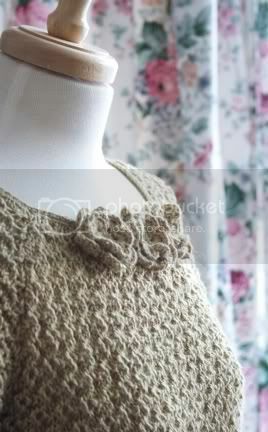 The first is The Rose Jumper, knitted in Blue Sky Alpaca Silk (one of the most gorgeous yarns on the planet). I love the crocheted flowers. The front neckline has small tucks sewn into it under the flowers to improve the drape over the bust. I have a beautiful wool tweed fabric which has the wheat colour of the jumper running through it, which I am making into a skirt - but its not finished yet. The second FO from A Stitch in Time is Variation on the Cross Over Line, for which I've used Rowan wool 4 Ply in this lovely old blue. 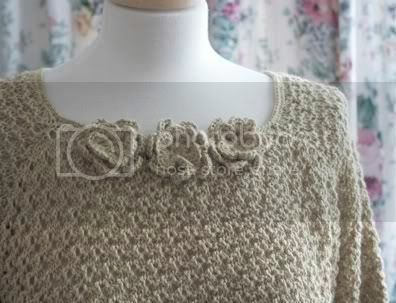 This is a very forgiving sweater and I could possibly have done a size smaller - I did the large - but there is no gape at the front which means I don't have to wear a brooch with it unless I want to. 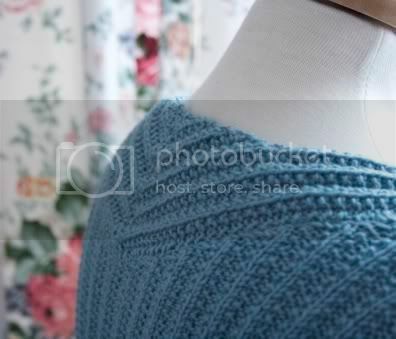 It is knitted in a really simple rib stitch which creates this great textured fabric with the most phenomenal stretch. And for those of us with an ample bosom it is extremely flattering. The front is knitted in three pieces (four sections) two of which cross over each other as can be seen. The two centre pieces extend over the shoulders to form this triangle detail at the back. I really think this is a timeless garment. So flattering and wearable. 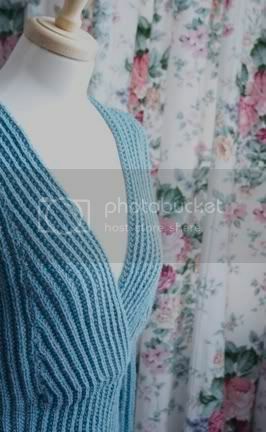 A while ago I mentioned that one of my designs was in Knits to Share and Care and I was given the garment back the other day so I could belatedly take photos of it. The design is called Babys Coming Home and is for premature babies to come home from hospital in. 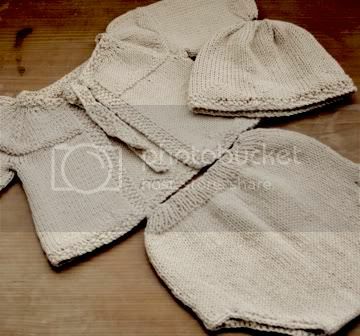 Its made using Rowan fine milk cotton so its super soft on the skin and in a natural cream shade. Unfortunately in the book it looks beige - still lovely, but beige. This is the full set of matinee coat, pants and hat. 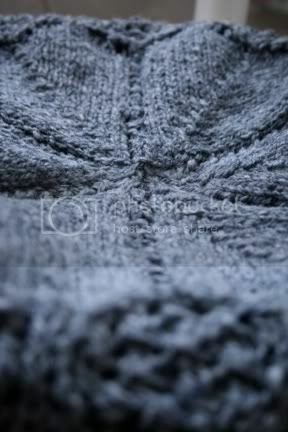 This is the detail of the 'triangle' pattern around the yoke, neck and on the hat. 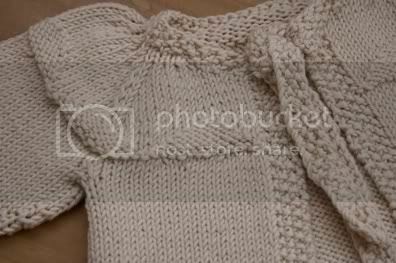 The coat is knitted in the round, sleeves are knitted on DPNs. I have two more FO's from A Stitch in Time waiting to be sewn up and a third on the needles. 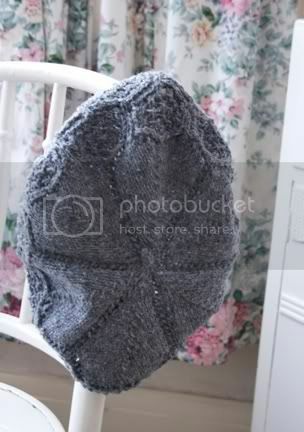 But taking a break from all this vintage knitting, I found two balls of Rowan Scottish DK lurking around and also this lovely beret pattern on Gudrun's site. I've been wanting a great hat for ages and this really has knitted up beautifully. I think the yarn almost looks like a rock formation. P.S. Update on that Galliano pattern coming soon.